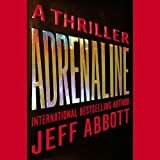 Adrenaline [sound recording] / Jeff Abbott. Contributor(s): Collins, Kevin T | AudioGO (Firm). Material type: SoundPublisher: North Kingstown, R.I. : AudioGO, Edition: Unabridged.Description: 12 sound discs (14 hr., 34 min.) : digital ; 4 3/4 in.ISBN: 9781611135022; 1611135028.Subject(s): United States. Central Intelligence Agency -- Officials and employees -- Fiction | Intelligence officers -- Fiction | Kidnapping -- FictionGenre/Form: Suspense fiction. | Audiobooks.DDC classification: 813/.6 Narrated by Kevin T. Collins.Summary: When his pregnant wife is kidnapped and he discovers that he has been set up as a traitor, brilliant CIA agent Sam Capra begins a desperate hunt for the unknown enemy who he believes has targeted the wrong man. Recording originally produced by Hachette Audio, p2011.